​This page is an introduction to the current workspace. Upload a logo, photo, or rendering; add some introductory text, include a map, even display the current weather. 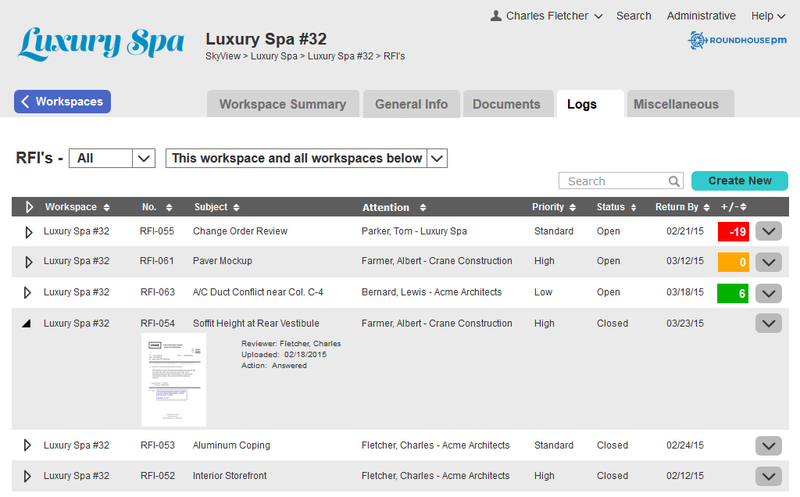 Like the SkyView page, the Workspace Summary page allows you to see the critical information for this workspace and all lower workspaces rolling up to this level. Allow you to create and post announcements for upcoming events, deadlines, important notices, and other announcements to share with other workspace participants. This screen shows some typical announcements for a project. Some of these are created specifically as an announcement (e.g. OAC Meeting or drawing releases), others are automatically created during the process of saving a record (e.g. submittals or RFIs) at which time you can send a notification to specific users of the workspace. 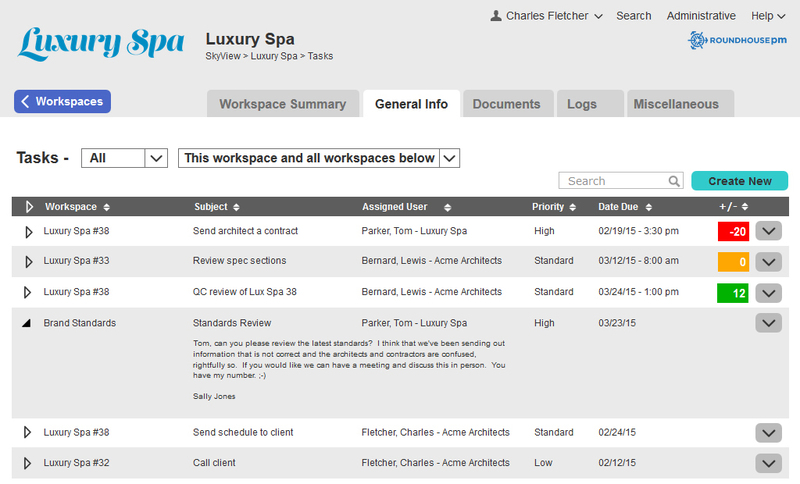 Keep project contacts in one location and accessible to all workspace participants. ​This screen shows Cuppa Joe Inc (Level3) and all of the users for this workspace and all of the Cuppa Joe projects (Level4) can be found at one location. 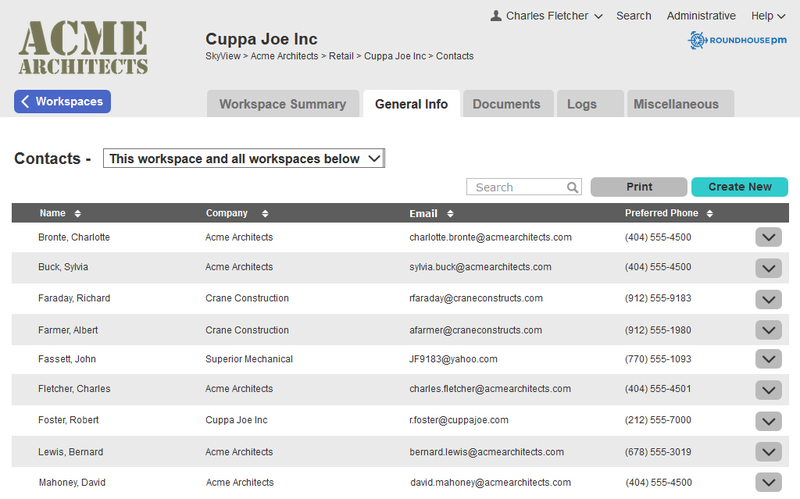 This allows Cuppa Joe employees to only look in one location for their contact directory. Create to-do items, assign them to other users, and track their progress through completion. 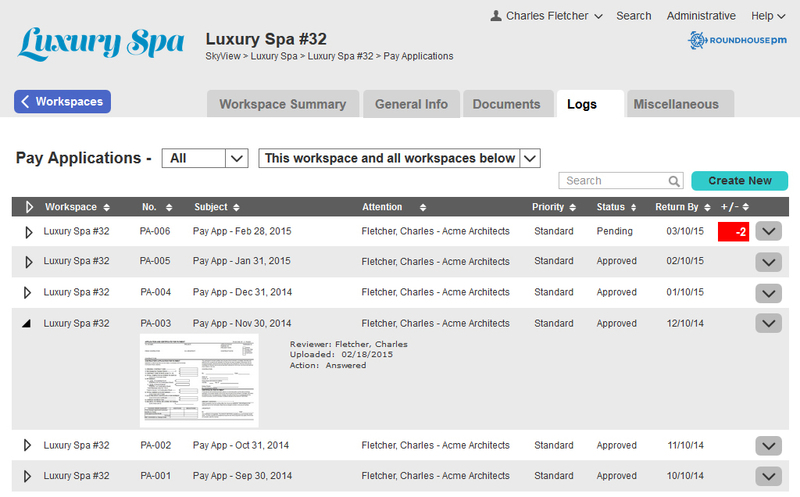 This screen is from the Luxury Spa workspace (Level1). This shows all the tasks for the entire pyramid because the data rolls up. 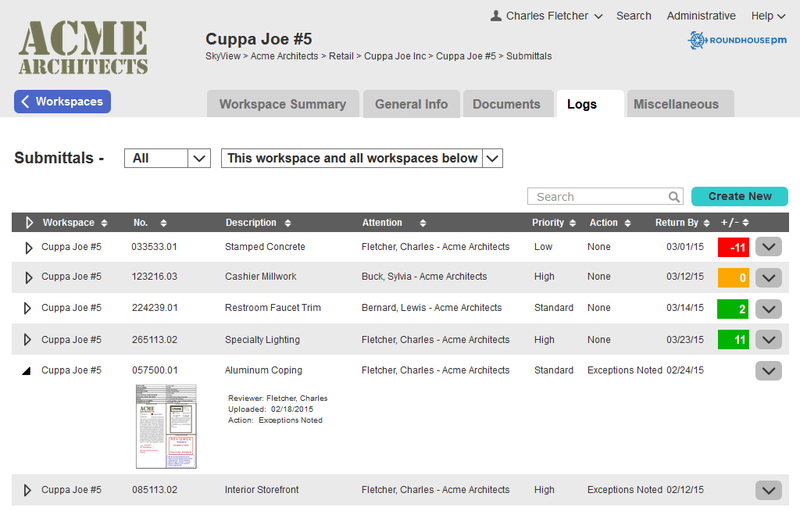 The Plans and Specs modules are some of the most useful tools in RoundhousePM. The key difference with the Plans and Specs modules is that they track and manage plans and specs released as “issue sets”, like “Pricing Set”, “Addendum 1”, “For Construction”, “Revision #2”, etc. Sets can be named anything you wish, these are just examples of set names typically seen in the AEC industry. As sets become updated, RoundhousePM consolidates the most current documents into a single set containing the latest version of each plan sheet or specification section. You can also always view any previously issued set as a permanent record of what was issued at any given date. 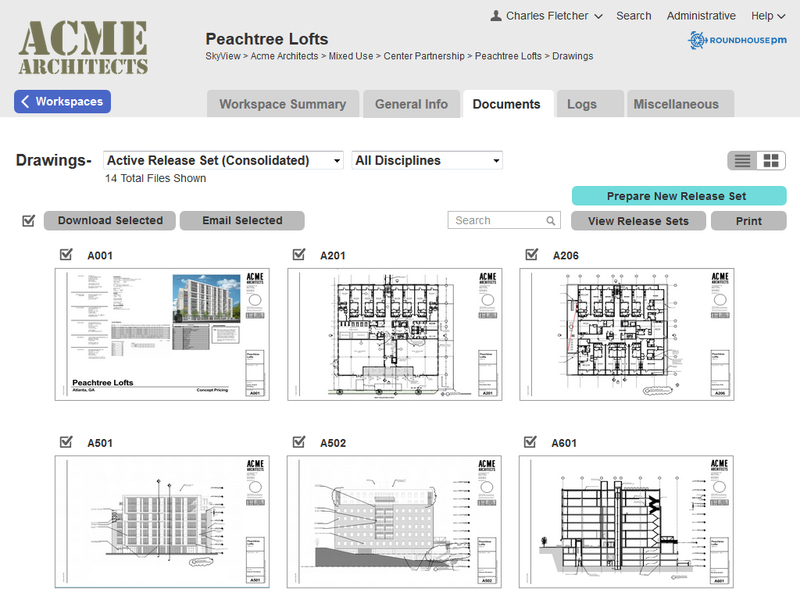 This screens shows the Active Release Set for the Peachtree Lofts project (Level4). The upper screen shows the Row View and the lower shows the Grid View. When you open this module you are automatically shown the Active Release Set of the most current of all sheets, but at any time you can change the view by selecting a previous release set from the drop down at the top. In addition you can filter these views by selecting only a particular discipline from the drop down. As you can see, this consolidated set is a combination of sheets that were issued at both the Concept Pricing and the Concept Pricing 2 release. This module is for sharing miscellaneous documents, which can be organized into folders. Project based documents might be BIM models, engineering reports, punch lists, product research, etc. Examples of firm-wide documents might be employee handbooks, office standards, templates, etc. 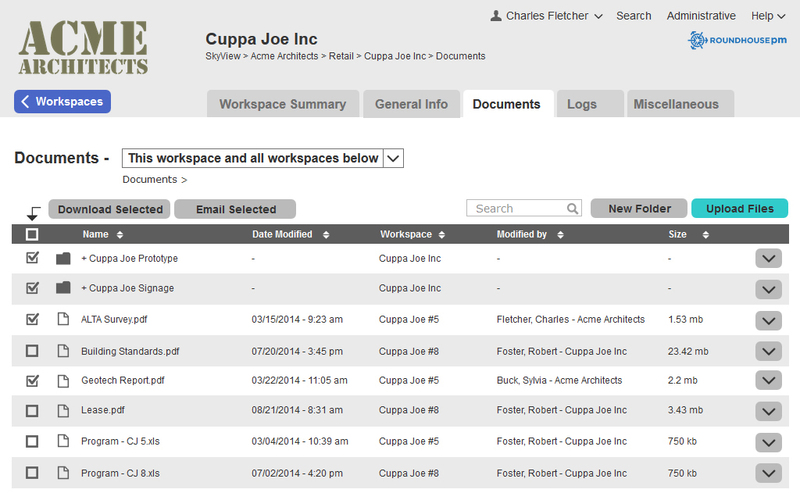 This screen is of the Cuppa Joe Inc (Level3) documents module. 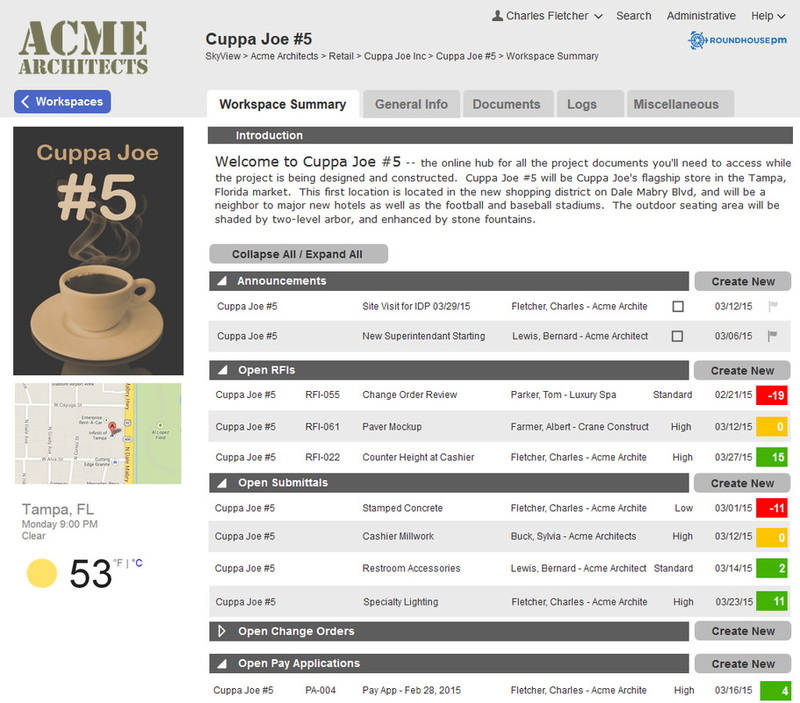 This module shows not only files uploaded to this workspace, such as the Cuppa Joe Prototype and Signage documents, but also project specific documents rolling up from the Level4 project modules. ​This module allows you to track RFIs throughout the project cycle from the general contractor to the architect’s review and back to the general contractor. If the project is in bid phase, all bidders have equal (and instant) access to communications and clarifications about any information, including drawings, documents, and any attached files. ​This module enables you to track submittals such as shop drawings and product data all the way through the approval process. Digital submittals and their attachments can be viewed instantly by all participants, eliminating the cost of couriers and document reproduction. This module allows you to upload pictures that can be shared and viewed as thumbnails, along with captions and notes. 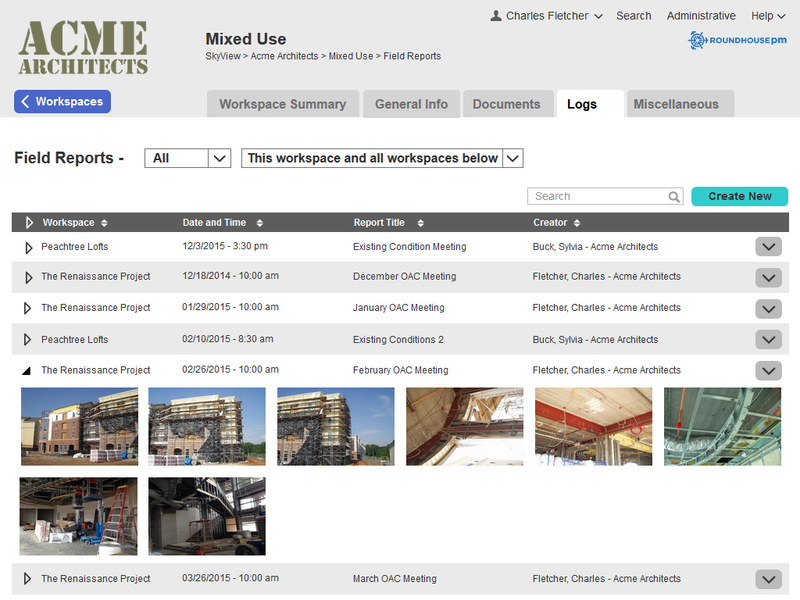 Your whole team can share images of construction progress photo sessions, proposed materials, punch lists, etc. 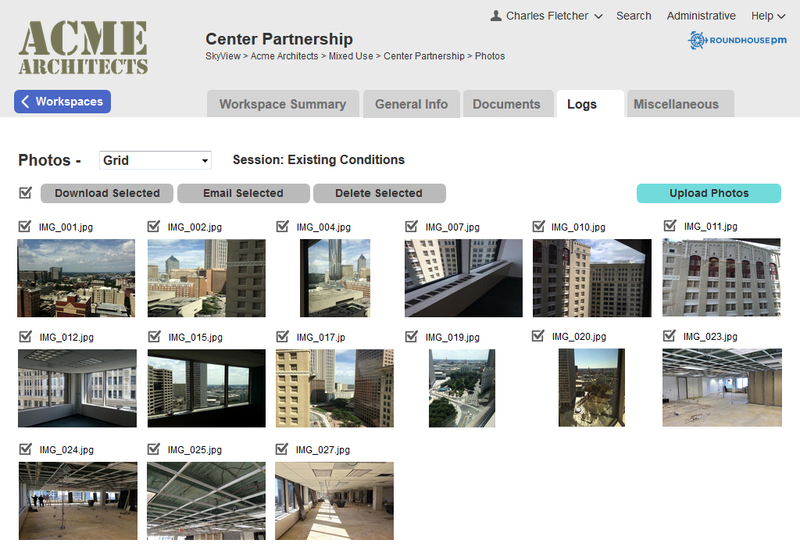 This screen shows images from the Existing Conditions photo session in Grid view. It can also be viewed as Rows or as a Slideshow. This module allows you to create a report of field conditions and on-site observations, as well as link photos from the Photos module. 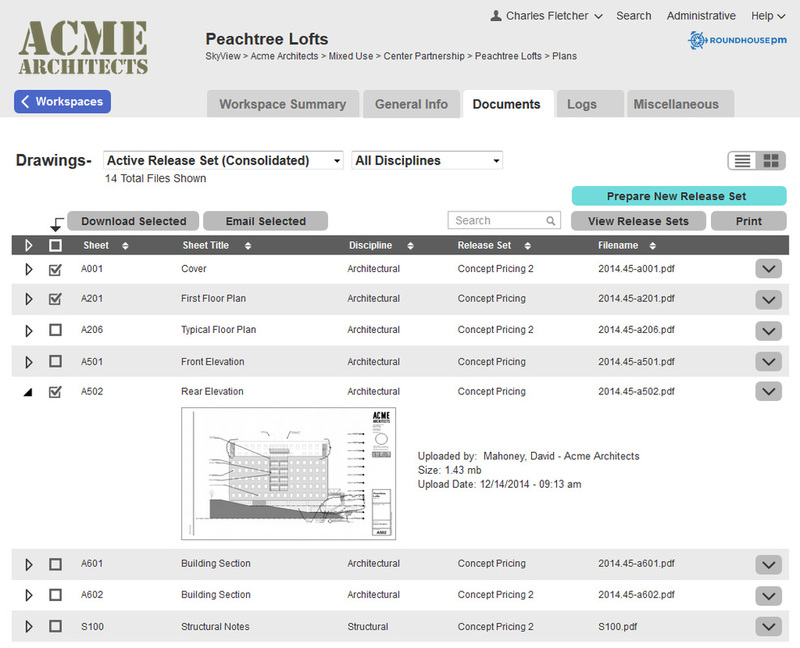 This screen shows the main page of the Field Reports module for the Mixed Use Studio workspace (Level2). If this were a large company, a studio director, or division head could see all of their pertinent information rolled up without having to see all the firm's projects, which they would see at Level1 workspace. This main screen shows only the photos included within a Field Report. Opening the record shows all of the typical information found in the AIA Field Report form. ​These 3 separate modules, much like RFIs and Submittals above, allow you to track the review and approval of paperwork associated with the change order process and pay application/certification processes. There is absolutely no risk for trying RoundhousePM. Sign up today and get 500mb of storage space for free.